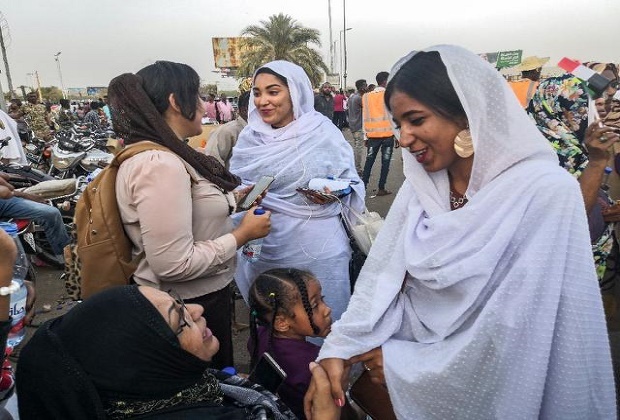 Khartoum (AFP) – A Sudanese woman propelled to internet fame earlier this week after leading powerful protest chants in the capital told AFP Wednesday that women are key to the uprising against President Omar al-Bashir’s iron-fisted rule. In the clips and photos, the elegant Salah stands atop a car wearing a long white headscarf and skirt as she sings and works the crowd, her golden full-moon earrings reflecting light from the fading sunset and a sea of camera phones surrounding her. Her new-found fame pushed her to set up her own Twitter account in which she thanked everyone “from the bottom of my heart. The struggle for a democratic and prosperous Sudan continues”. In another tweet Wednesday she says she “wanted to get on the car and speak to the people… speak against racism and tribalism in all its forms, which affects everyone across all walks of life. “In such movements, women are widely participating not only for their rights but for the rights of the entire community… there’s no difference between women’s rights and community rights,” Salah told AFP.